The Trump administration’s lackeys continue to annoy the American populace on a daily basis. Take Sarah Huckabee Sanders…please. She keeps complaining about how the press is unfairly spreading ‘fake news’. We’ve already commented about how this bible thumper has been repeatedly bearing false witness in front of the nation despite her religion teaching its followers that lying will lead to eternal damnation. Now Ms. Sanders is whining about how the press calling her a liar is making her feel bad. Oh really???!!! Poor baby!!! And Ms. Sanders’ daily lies don’t make us feel miserable???!!! It’s truly astonishing that the gaslighting Republicans think that many Americans, including the press, can’t discern the truth that Trump and his entire administration are nothing but pathological liars. We’ve already mentioned the database of Trump’s lies being kept by the Washington Post’s Fact Checker. 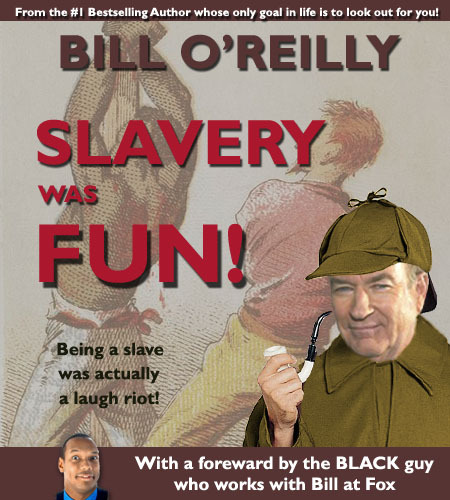 There’s also overwhelming video evidence of him lying!!! Just check Youtube! Of course, Trump and the Republicans have some help spreading their deceptions with their very own propaganda network, a.k.a. Fox News, which many of the christian sheeple follow without question, like the good little authoritarian automatons they are. But as for Sarah Huckabee Sanders: we have no sympathy whatsoever for this women. She is nothing but a gargantuan hypocrite. Want to stop feeling bad, Ms. Sanders? Stop lying!!! 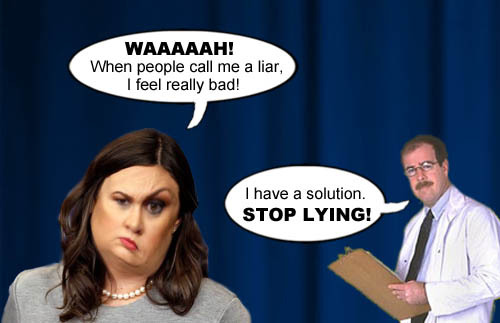 A kindly doctor provides some friendly advice for whiny Trump administration Press Secretary and pathological prevaricator, Sarah Huckabee Sanders: STOP LYING!!! 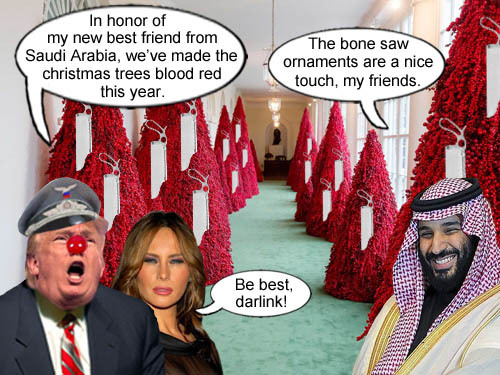 There are so many incompetent enablers in the Trump Administration’s White House, it truly is dizzying to contemplate and nauseating to live with. We’ve already commented on many but we’ve yet to talk about Press Secretary and Chief Prevaricator, Sarah *uckabee Sanders. 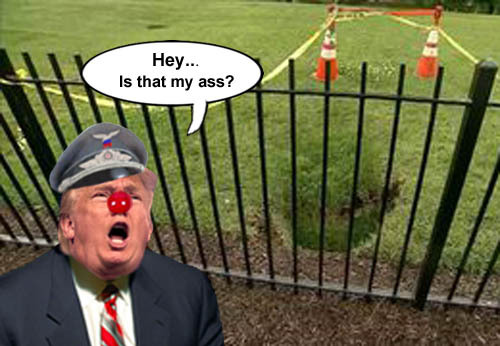 We never thought she could outdo the previous Press Secretary, Sean ‘ Spicey’ Spicer, on bald faced lying to the public but as everything else with this clownish administration, new depths of ineptitude are explored and exceeded everyday. Ms. Sanders is only thirty-five years old but owes her high profile job to the fact that she is Mike *uckabee’s daughter. Former Arkansas governor *uckabee was one of the clowns in the Con-a-thon 2016 Republican clown car and is a well known bible thumper. 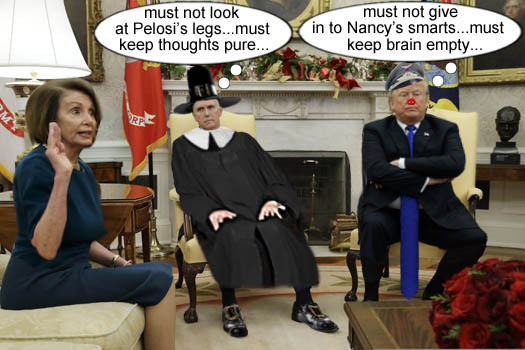 Trump’s been giving some of his fellow clowns, like Ben Carson and Rick Perry, high profile positions in his cabinet. So it’s really no surprise that he’s given the position to someone so vastly unqualified. Hey, look at Jared Kushner and Trump’s own daughter Ivanka. Ms. Sanders should realize that according to her belief system, lying or bearing false witness is a sin and punishment by damnation in hell. We find it funny that she’s been wearing more and more makeup in her press briefings in an attempt to make her appear less repugnant. She should realize that her obsequious fealty to Trump, dishonesty and lack of integrity makes her more unsightly than Ursula from the Little Mermaid, whom she curiously resembles. 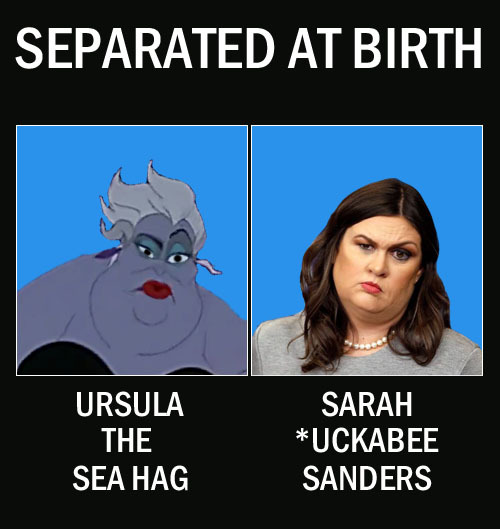 Trump administration Press Secretary and pathological prevaricator, Sarah *uckabee Sanders, bears a striking resemblance to beloved cartoon sea hag, Ursula.